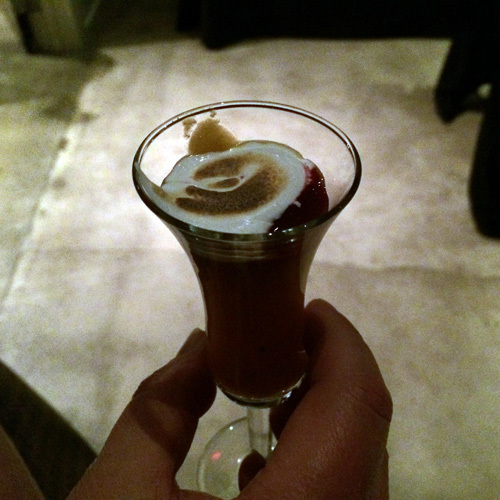 Quick note: I asked D. to guest-write this post as he was very passionate about the night. Growing up in and out of commercial kitchens, I recognize that restaurant culture is very similar to home-kitchen culture. It’s one of family and nourishment. If you’ve only experienced restaurant culture via “Hells Kitchen” or other popular television cooking shows, you more than likely don’t see the ‘sense of family’ a well-run commercial kitchen can provide. 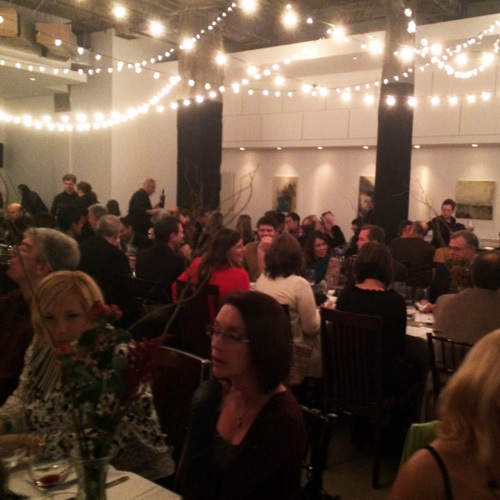 The recent “Chef’s Collective” dinner did a great job of expressing that love & camaraderie to the public. And I’m very pleased it did. 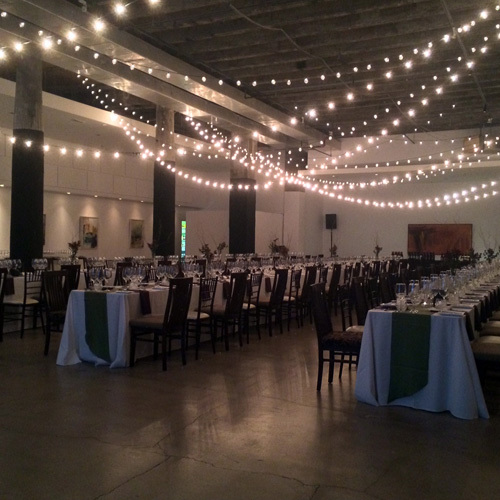 Cooking for 120 people in a staged, 11 course meal, with 11 chefs in one kitchen, and limited staffing is mind-blowing. It’s incredible they even attempted it. 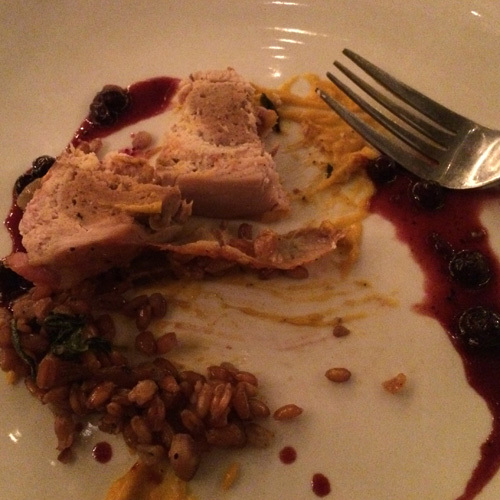 The dinner was themed “thanksgiving” with each chef blending a course with the theme. Very complicated, in the scheme of things and production! Our evening started with a glass of “2011 Querry Cidre” in the main dining room of our favorite restaurant, Registry Bistro. The place was PACKED! and to be honest, it was a bit tough to find the first round of appetizers. They were being walked around by staff on trays, and we were lucky enough to try two of the three options prepared by Chef Rob Rousseau from the Gathering. The “Sweet Potato Puree w/ Blackberry Coulis & Toasted Fluff” was delicious but difficult to eat with no utensils provided. We entered the main dining room and everyone filled into their assigned seats. Frankly, I’m glad they chose where everyone sat… it forced strangers into conversations about food, etc. they would have otherwise not had. We were seated near a tomato farmer, the family of one of the chefs, and a group of housewives that clearly love food. One of them exclaimed early on, “I only spend money on three things: nice jeans, my hair and eating out.” I loved the sentiment. 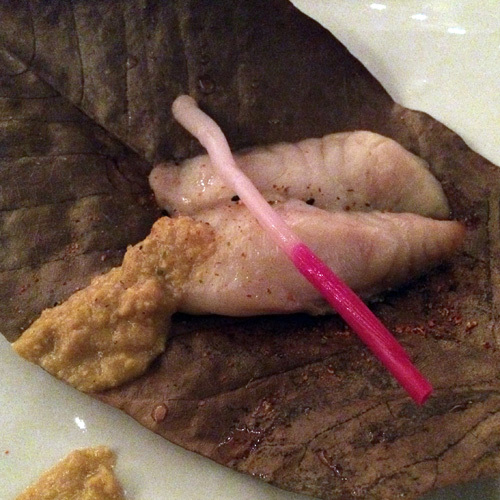 The first course was by Chef Mike Bulkowski from the famed but recently closed Revolver. 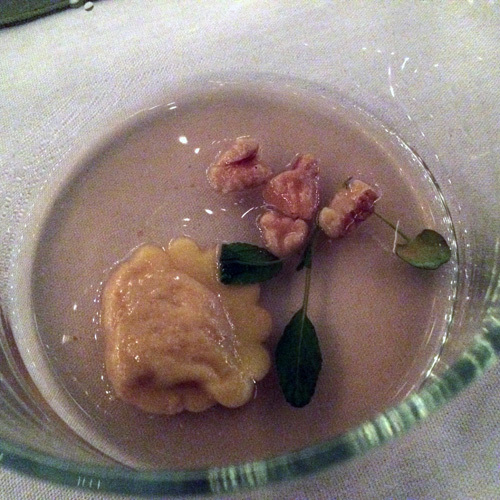 The turkey consommé was very, very, very subtle and delicious, and of course the pumpkin ravioli was divine. I have to say, I approached the walnuts with caution. 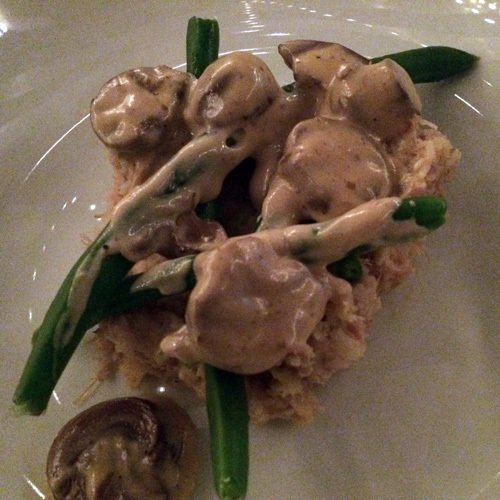 Next up was a mushroom “stroganoff” salad from Chef Rob Lucas at Bar 145. This was one of the many “game changing” dishes for me. Not so much because it was a mind blowing serving in and of itself, but more because it helped reframe the chef & restaurant they came from. While I’m a fan of Bar 145, burgers aren’t normally “game changing”. But after Chef Rob’s mushroom salad, I realize he’s capable of much more. This was a most excellent dish. There was a surprising amount of flavor and some unexpected textures. 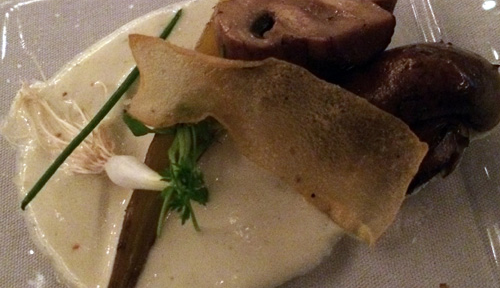 I hope these “Chef’s Collective” dinners will push the individual Chefs to upgrade their menus. I would LOVE to see a truffled salt and cognac creamed burger on Bar 145’s menu. The flavor combo was THAT good. We grabbed the last of the sadly scant bread to sop up the sauce. 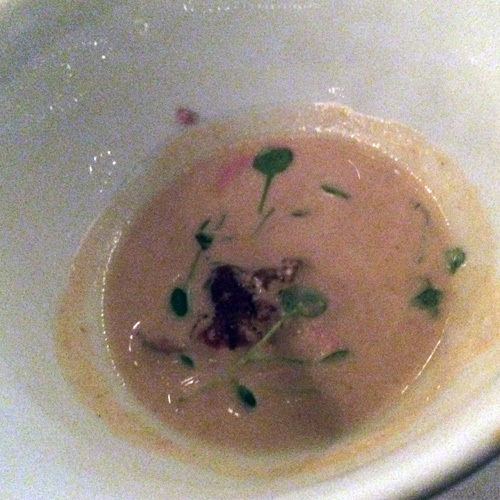 Next was a “Pecan Bisque” with ginger-roasted quail breast and serrano chili, by Chef Mike Rosendaul from the Toledo Club. It was spicy, delicious, and my wife who normally never eats bird skin LOVED her portion of quail. This was a surprise hit from the Toledo Club, who usually play it “safe” when it comes to food. Great heat and texture. Soup was followed by “oyster stuffing” with hubbard squash and a fried oyster on top by Chef Rob Campbell of Revolution Grille. Everyone at the table agreed that it was pretty darned good though I would have loved the stuffing to be warmer. 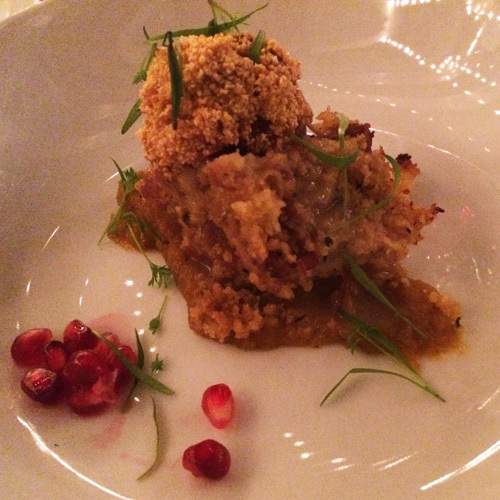 The fried oyster was hot, and the pomegranate seeds were a nice touch. 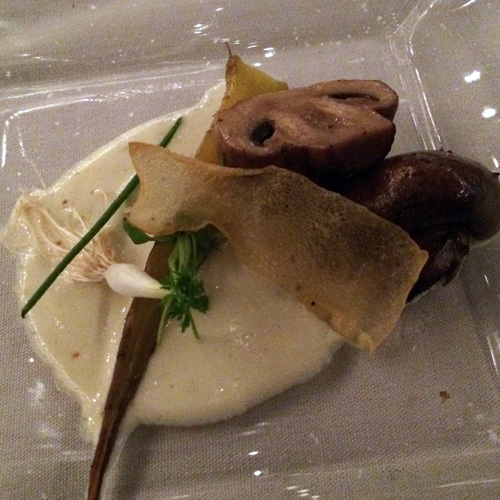 It should noted that each course was expertly paired with a small sampling of wine by Adam Mahler. 11 courses of wine may sound like a lot, but the samples were really just tastings, a couple of sips at most, per glass. I’m not much of a wine guy, but I enjoyed everything I tasted. Next up was Chef Kengo Kate from Koreana. The baked Miso Tile Fish was the most attractive and dramatic dish of the meal. The ginger stick was a delicious surprise although the “yakimorokoshi” sauce was a bit overpowering… wonderful regardless. Next (YES, there is more) we had Chef Micah Risher’s duck confit in yukon gold mash with hericot vert and creamed cremini. This was another one of those “game changer” dishes. Chef Micah from the “House of Eats” is known for glorified and notably ‘nutty’ bar-food. BUT his contribution to this dinner was anything but bar-food. The potatoes, duck and green beans all melted together. It was delicious, deep in flavor and perfect in texture. We’ve never been to House of Eats, but now it’s on our short list, even if we end up just getting chicken wings & burgers. It’s clear Chef Micah’s food is made with love. 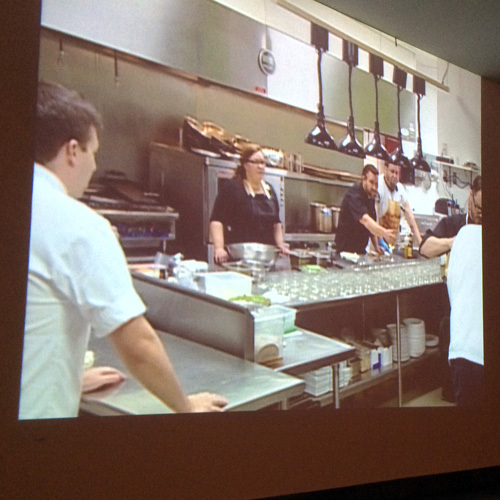 One of the most fascinating things happening during the dinner, was the live kitchen-cam projected on the wall for all of the diners to watch. 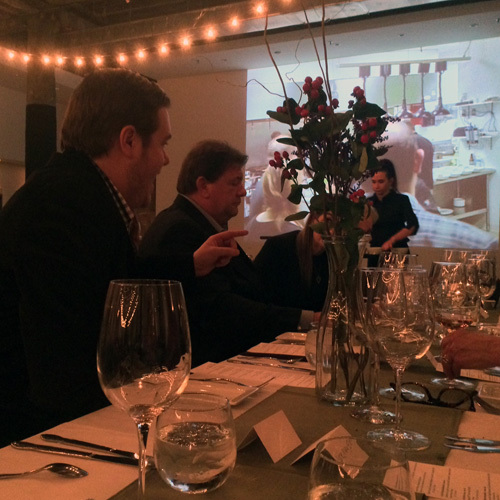 Every course saw a different chef at the helm, with people frantically plating-up dishes. It was great to see all of the chefs interacting and working together. Team work at it’s tastiest! 11 courses over 4 hours found us all getting quite full by the time the last two entrees arrived. 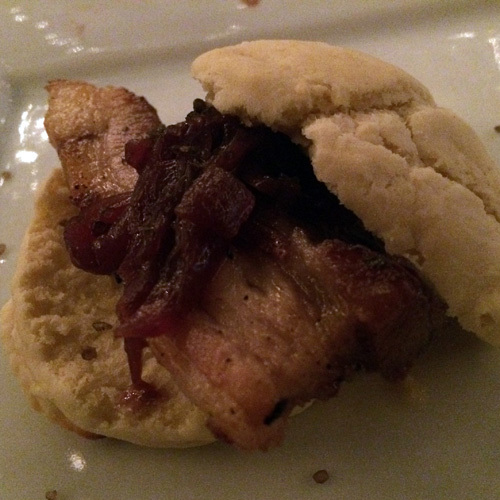 Reverend’s pork belly on a potato biscuit was delicious with little crackles of salt enhancing the flavor and mouthfeel. Chef Erika Rapp’s take on a turducken with Turkey, squab & pheasant was great and the roasted chestnut sauce was a highlight. It was the day after her birthday and the crowd sang her praises. While I’ll claim time and time again that I’m not a sweets guy, Chef Chris Nixon from Element 112 proved me wrong yet again. 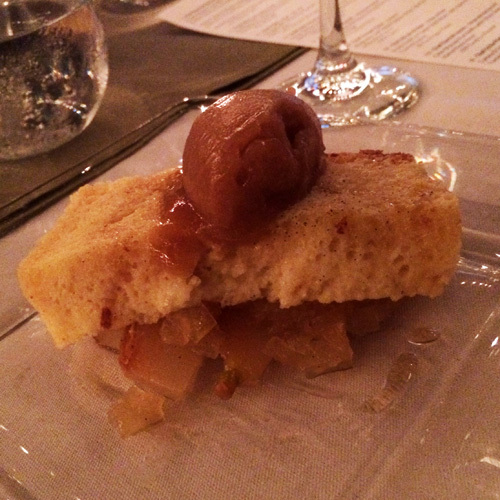 His stunning onion & pear bread pudding with maple honey sorbet was a crowd favorite. I loved it. Such a bright and tasty way to end the meal. We’re sure Chef Moussa Salloukh from La Scola‘s pumpkin crème brûlée was wonderful, but with bedtime approaching, we took an opportunity to leave before the other 120 diners ran to the valet. It was a stunning evening and we were struck with not only how much talent we now have in the Toledo area food scene, but also what an incredible food culture we are growing in the area. 120 seats, sold out in less than 2 weeks with zero advertising… all word of mouth and to top that, $120 a head for a Monday night event. Talk about a good sign of things to come!